I have grown plenty of different strawberries over the years. I have grown some from seeds, others from runners, others from divisions. 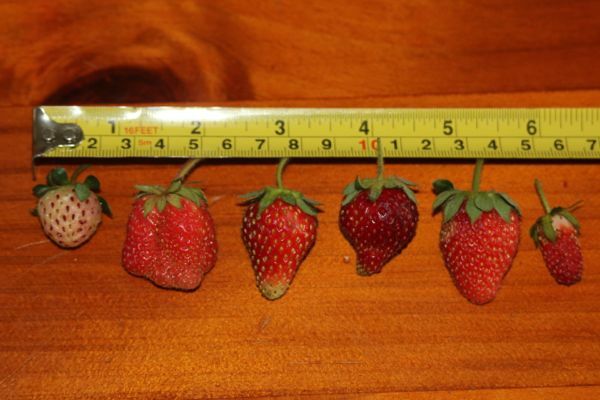 Most strawberries available to home growers are complex hybrids of various species of strawberry, most are hybrids of species from different continents. 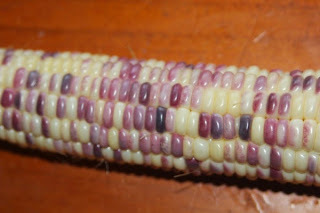 I grow a lot of these complex hybrids, I also have a few wild species that I am growing from seed, but they will have to wait for another blog post. Strawberries are perennial plants, if the right variety is grown under the right conditions they can be extremely productive. This year, among other things, I grew pineberries, strasberries, bubbleberries and Sweetie (which was sold by the Nellie Kelly brand). 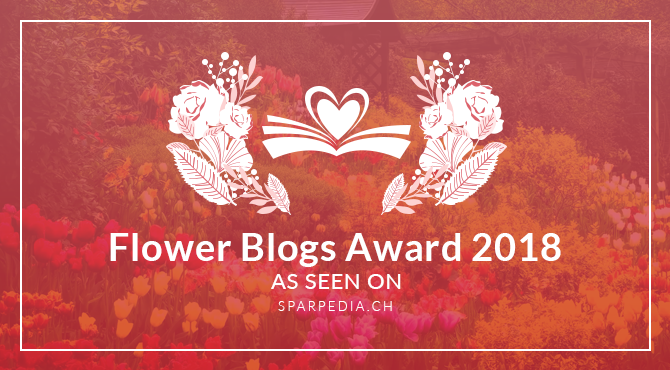 Strangely there is little information on the internet from anyone who has grown them, so I thought I should write a post about them. The pineberry is a white fruited strawberry, it will NOT grow true from seed so if you want them you must grown them from plants. Many thieves on ebay have made a lot of money from selling pineberry seeds. Please never buy pineberry seeds or anything from someone who has pineberry seeds for sale. Pineberry is not GM, it is NOT terribly new, it is NOT a cross between a strawberry and a pineapple or anything else. Pineberries are NOT albino plants, if they were the leaves would be white or yellow and the plant would not survive very long as it could not photosynthesise. The pineberry is said to be a hybrid of two species of strawberry, the South American Fragaria chiloensis, and the North American Fragaria virginiana but they may also have other species in their heritage or even back crossing. From what I understand they have been around for a very long time but have only recently become more readily available to home gardeners. My pineberry plants are all female, they require another variety of strawberry growing near by for proper pollination. Being pollinated by another plant does not change the taste or shape or colour of the strawberry, but if you grow the seeds they will not be pineberries. The pineberry flowers have white petals. My pineberry plants happily grow runners so can easily be allowed to cover an area with new plants. I like strawberries that produce runners as it means it is simple to increase my stock quickly with little effort from me. I can use them as edible ground covers. It also means that if a few die, then it is no great loss. 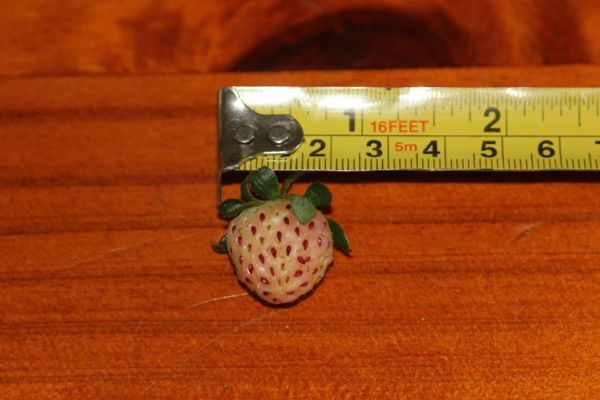 Our pineberries grew small strawberries, being so small I expected them to be super sweet, but they were not. The pineberry strawberries were white when unripe and ripened a light pink with red achenes. Pineberry is said to taste like a mix of pineapple and strawberry. I can understand this, they did almost taste a bit pineapple like, I guess. They were reasonably sweet, I guess, but we have other strawberries that are far sweeter. I found them a bit sour but they do have a depth and complexity of taste. I don't dislike them, they were a bit sour and they may taste slightly different later in the season. Strasberry strawberries are another hybrid of various strawberry species, these were developed in 1925. They, just like the pineberry, are not GM, they are not a cross between strawberries and raspberries. My strasberries also only produce female flowers so require a pollinator to set fruit. My plants all had flowers with white petals. The strawberries were very small and dark red with the achenes set deeply in each strawberry. They were not overly productive, but the plants are young and the season is early so things may change as the plants mature. 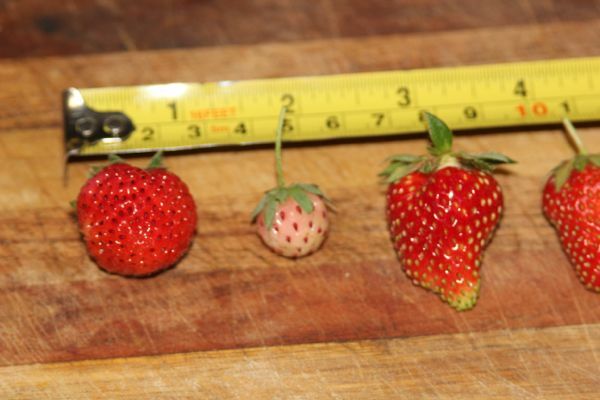 My strasberry plants set runners, but less so than the pineberries. 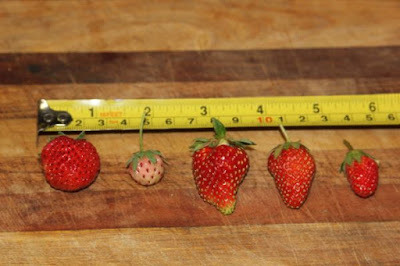 Again, if the seeds are planted they will grow into a mix of strawberries none of which will be a strasberry. I forgot to take any pictures of strasberries, we ate them before I thought about it and then they stopped floweringnext time they produce fruit I should try to remember to take some pictures. Strasberries are said to taste like raspberries, I guess if I wish really hard while I am eating one I can kind of almost pretend to taste this. They taste ok, far better than the garbage I can buy from a shop, but I prefer the taste of regular garden strawberries. Bubbleberry strawberries, like most garden strawberries are most likely another hybrid of various strawberries. There is also a chance that they are a strain of the European Fragaria moschata. I have seen different sources claim both. To be honest, I don't know. Bubbleberry strawberries, just like every other strawberry plant that the home gardener will have access to, is not GM. The bubbleberry strawberry is another extremely old variety that has recently become more available (and gained a more marketable name). The bubbleberry strawberry has been around since at least the 16th century. Bubbleberry strawberries grow runners, but mine have not produced many yet. It has complete flowers so can be used as a pollinator for pineberry and strasberry. Bubbleberry is said to taste a bit like bubblegum, and others say it tastes of mixed soft fruit. One internet site said bubbleberry "is the strawberry with the strongest flavour and most mouth-watering aroma in the world.". Mine taste like a great tasting strawberry which has a good mix of sweet and sour. They are not the strongest tasting and most amazing strawberry I have eaten, but they are pretty close. Mine also taste nothing like bubblegum, and I am very glad about that. Sweetie strawberries do not produce runners, which some people like. As a backyard gardener I find the runnerless trait to be undesirable, I want plants that throw runners everywhere to increase my patch and out compete weeds and I can grow them in difficult places as edible ground covers. Sweetie strawberries are a variety of common garden strawberry called Fragaria x ananassa. Being runnerless they are likely to have alpine strawberry in their heritage. Without genetic testing we will probably never know. These 'sweetie' strawberries flower well and are very strong plants. I should be able to take a spade and divide my plant into many plants when the weather is cooler. 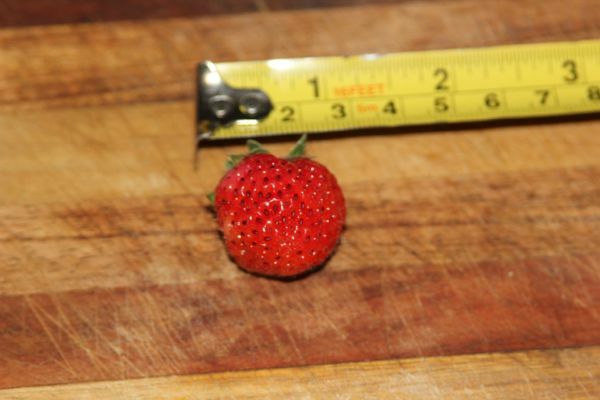 Sweetie strawberries are a reasonable size berry and taste great. Some of the sweetie strawberries are odd shaped, but most are pretty regular. They are sweet, as per their name, and they have a nice strawberry taste to them. They also seem to outproduce pineberry, strasberry and bubbleberry but that may be because all the plants are new and things could change as they become more established. I prefer the taste of Bubbleberry strawberries to sweetie strawberries. Bubbleberry is indeed a variety of Fragaria moschata. However, your 'bubbleberry' must have been mislabeled, because it is clearly a different variety, probably a regular garden strawberry. thank you for the message. My pictures aren't terribly good. The strawberries were rounder and have deeper set seeds than most strawberries. The colour ranged from dark pink to red. They looked similar to the few pictures I found on the internet. That being said, I wouldn't be terribly surprised if the bubbleberry we have in Australia is different from true bubbleberry. The company I got them from is known for renaming things to make them more marketable. hello, does anyone out there have a few bubble berry plants or root stock they would be willing to sell me. I would be happy to pay for shipping or if you are in the four corners area I would be happy to come an pick them up. Again I'm not looking for handout I'm willing to pay for them.